This discovery is actually a couple years old, but I wanted to document it in my blog – and I have an important new lead to discuss. It is a nice example of discovering new ancestors whom you never knew about before. For our family, that’s pretty rare at this point. It’s a breakthrough related to my 3GG Mary Hamilton Tabele (1795-1869) on my father’s side. 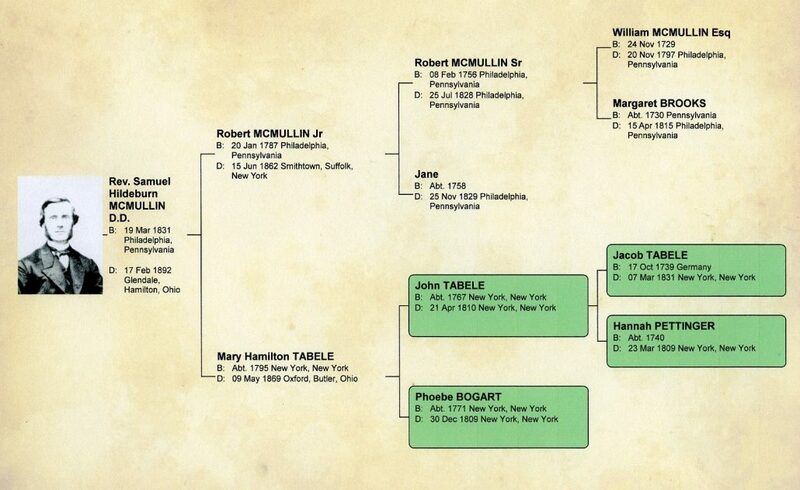 Background: Mary Hamilton Tabele was a Philadelphia girl who married Robert McMullin, Jr. (1787-1862) in 1829. Robert was a prominent lumber merchant and member of Old Pine St. Presbyterian Church in Philadelphia. Sara will remember him because in 2012 she and I visited the house they built at 411 Pine St. in Philadelphia, a registered historic building. There were three sons of this union, all of whom attended Princeton Theological Seminary and became Presbyterian ministers. The oldest son, Rev. Samuel Hildeburn McMullin D.D. (1831-1892) was my 2GG. He never stayed very long in any one job, probably due to his caustic personality. According to my great aunt Eleanor, he had the habit of “ridiculing parishioners from the pulpit” during Sunday sermons!1)Nelson Jonnes, “Jonnes Family Record 1995,” 3rd edition, unpublished manuscript, p. 17; bound copy #6 privately held by Steven Nelson Jonnes, Ashburn, Virginia, 2018. The longest he ever stayed anywhere was nine years as the pastor of the First Presbyterian Church in Circleville, Ohio (1873-1882). That’s where his daughter, Mary J. McMullin (1858-1951), met and married my great-grandfather Dr. Howard Jones (1853-1945). preaching was cut short by chronic laryngitis. He ended up serving in a number of administrative capacities for the Presbyterian Board of Education in Philadelphia. My father studied Mary Hamilton Tabele for decades and could never make any headway on her parentage. Partly what intrigued him was the fact that his own father, Dr. Lloyd Jonnes (1890-1952), had a brother named Tabele who died as an infant. (Tabele Jones died of pneumonia in 1888, aged two months.) What made Dad’s search difficult was that he never could verify Mary Hamilton Tabele’s birth year or place. Her 1850 census enumeration provides an age of 55, but it also says her birth location is Pennsylvania – which is almost certainly incorrect.3)1850 U.S. Census, Philadelphia County, Pennsylvania, population schedule, Philadelphia Pine Ward, p. 307A, dwelling 450, family 548, Mary McMullen in Robt McMullen household; digital image, Ancestry.com (http://www.ancestry.com : accessed 1 November 2018); citing NARA microfilm publication M432, roll 813. Adding to the mystery, the Tabele surname is extremely rare. None of the surname origin websites has any information. There were only 3 families with that surname in 1820 U.S. census and 5 in 1920 U.S. census. Discoveries: The main reason Dad never made any progress finding Mary Hamilton Tabele‘s parents was that she was actually from New York City, not Philadelphia. I finally made the breakthrough from old newspaper articles and legal records, including her grandfather’s probate file.4)New York County, New York, Probate Proceedings, 1830-1865, probate file of Jacob Tabele (May 1831), liber 67, pp. 400-468; Surrogate’s Court, New York, New York; digital image, Ancestry.com (https://ancestry.com : accessed 20 October 2017). She moved to Philadelphia when she was a teenager after the early demise of both parents. Ultimately, the rareness of the Tabele surname is what allowed the discovery. 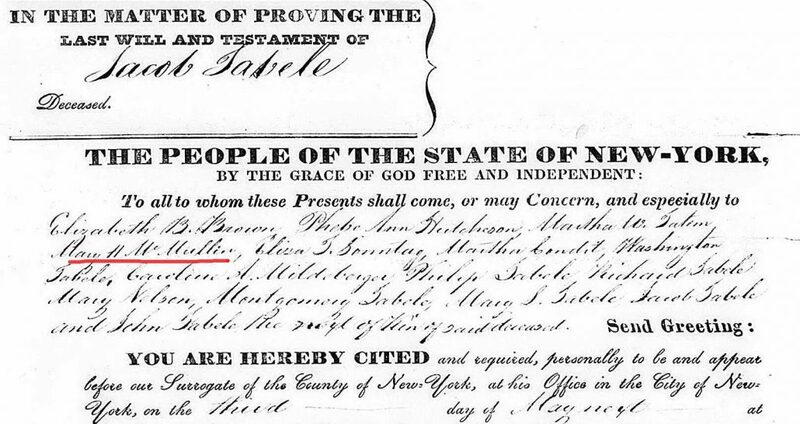 The only family showing up in early U.S. census records with that name were some Tabeles in Manhattan in the late 1700s and early 1800s – in particular, a long-lived gentleman named Jacob Tabele (1739-1831). Sure enough, the Manhattan Tabeles were Mary Hamilton’s family. The discovery is that her parents were John Tabele (1767-1810) and Phoebe Bogart (1770-1809). Jacob Tabele was her paternal grandfather. Jacob Tabele and his several sons (John, William, Jacob, Jr., James, Phillip, and Richard) were merchants and craftsmen who appear to have been relatively well-known and prosperous. Son John Tabele, for example, was an election inspector in the 6th ward for the 1798 election.5)“Inspectors,” Argus, New York, New York, 12 April 1798, p. 2, col. 2; digital image, GenealogyBank (https://www.genealogybank.com : accessed 13 November 2018), Newspaper Archives. Son Phillip Tabele was editor of the American Patriot, and Public Advertiser, published from 1809 to 1813.6)“To Mr. Phillip Tabele, Editor of the Public Advertiser,” Columbian, 15 May 1811, vol. II, issue 477, p. 2; digital image, GenealogyBank (https://www.genealogybank.com : accessed 13 November 2018), Newspaper Archives. Mary’s connection to grandfather Jacob Tabele is confirmed by a reference to Mary H. McMullin on p. 465 of Jacob’s 1831 will papers.7)New York, N.Y., “Probate Proceedings,” 1831, Jacob Tabele, pp. 465. She is among those listed as heirs who are commanded to appear in court on 3 May 1831 for the reading of the will. I’ve underlined Mary’s name in red. The spelling of the Tabele surname is fairly consistent for the time period, although it may also be found as Tabely, Tably, and Tabeley. I assume that Tabele was pronounced with two syllables – /’tæb.li/ – but maybe it was actually three – /’tæ.bƏ.li/ – or maybe it was pronounced like the word table. Actually, the pronunciation could have changed over time as well as the spelling, now that I think about it. The Tabele line is the only New York City connection in Dad’s entire tree. Mom’s tree, of course, has the great Vermilyea connection to Manhattan in the 17th century. Mary Hamilton Tabele was probably born in Manhattan and was definitely raised there. In 1810 when she was about 15, her parents died within 4 months of each other. Of what, we do not know. Another yellow fever outbreak, perhaps? Her father, John Tabele, was only 43 when he died, her mother only 38. John was in business together with his brother William Tabele (1771-1808). Their mercantile firm closed after William died in 1808 after a “fall from a chair.”8)“Household Members,” New York Weekly Museum, New York, 8 August 1808, William Tabele death entry, p. 669; database online, Ancestry.com (https://www.ancestry.com : accessed 20 February 2016), citing “U.S., Newspaper Extractions from the Northeast, 1704-1930,” call no. 486670. Soon after the demise of the parents, Mary and at least two sisters moved to Philadelphia. I assume they were sent to live with a relative or close family associate in Philadelphia. All three sisters married in Philadelphia. Phebe Ann Tabele (1797-1884) married Benjamin P. Hutchinson (1798-1875) in 1818. Martha W. Tabele (1799-1881) married Dr. William A. Tatem (1800-1877) in 1824. And finally, Mary – our ancestor – married Robert McMullin, Jr. in 1829. It was her first marriage, his second. She was about 34 at the time. Mary’s grandfather, Jacob Tabele, Sr., lived to be 91 years old. He clearly had an eventful life, arriving from Germany in his youth, serving in the 1st New York Regiment during the Revolutionary War, building a successful life in Manhattan, and outliving two wives and almost all his children. His address, at least according to an 1829 city directory, was 111 Fulton Street.10)Catherine Hollister, compiler, Manhattan New York City Directory: 1829-1830, p. 544, “Jacob Tabele;” database online, Ancestry.com (https://ancestry.com : accessed 20 February 2016), citing Longworth’s American Almanac, New-York Register and City Directory for 1829. New York, NY: Thomas Longworth, 15 Pine Street, 1829. (That location currently houses an Au Bon Pain sandwich shop!) About a year before he died, he was run over by a carriage in the street. 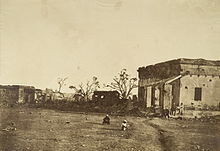 He was living at the end with his daughter-in-law, Mrs. Mary Tabele, widow of his son Phillip Tabele, and two grandchildren, Montgomery and Maria Louisa. He changed his will several weeks before he died and ended up giving pretty much everything to her and the two grandchildren. This triggered a lawsuit from the other heirs. The Tabeles are likely German in origin, based on Jacob’s grave record.11)“Find A Grave Index,” database, FamilySearch (https://familysearch.org : 13 October 2018), Jacob Tabele, 1831; Burial, New York, New York (Manhattan), Saint John’s Burying Ground; citing record ID 83709453, Find a Grave, http://www.findagrave.com. John Tabele’s wife Phoebe Bogart was almost certainly Dutch because the Bogarts are a very old New Amsterdam family from the 17th century. The new lead I found bolsters the German connection. Jacob Tabele‘s father may be a German immigrant named John George Tablet (1720-1783). That was his Americanized name upon immigration; he was born Johan Georg Deibel in Mutterstadt, Germany in 1720. He died in Throgs Neck, Westchester, New York in 1783. John George’s will divides his property among three daughters, Catherine, Mary Magdalene, Dorothe, and his eldest son, Jacob Tablet.12)New York County, New York, Probate Proceedings, 1830-1865, John George Tablet will (1783), vol. 35, pp. 206-207; New York State Archives; Albany, New York; Records of wills and probates, 1665-1787; Series Number: J0043-92; digital image, Ancestry.com (https://ancestry.com : accessed 20 October 2018). I’ll have to look into this more closely. 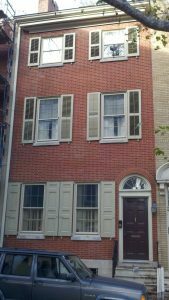 Research whom in Philadelphia sisters Mary, Phebe, and Martha Tabele may have moved in with circa 1810. 1. ↑ Nelson Jonnes, “Jonnes Family Record 1995,” 3rd edition, unpublished manuscript, p. 17; bound copy #6 privately held by Steven Nelson Jonnes, Ashburn, Virginia, 2018. 2. ↑ “Philadelphia Missionaries Slain in India,” Philadelphia Inquirer, 17 October 1857, vol. LVII, issue 93, p. 1. 3. ↑ 1850 U.S. Census, Philadelphia County, Pennsylvania, population schedule, Philadelphia Pine Ward, p. 307A, dwelling 450, family 548, Mary McMullen in Robt McMullen household; digital image, Ancestry.com (http://www.ancestry.com : accessed 1 November 2018); citing NARA microfilm publication M432, roll 813. 4. ↑ New York County, New York, Probate Proceedings, 1830-1865, probate file of Jacob Tabele (May 1831), liber 67, pp. 400-468; Surrogate’s Court, New York, New York; digital image, Ancestry.com (https://ancestry.com : accessed 20 October 2017). 5. ↑ “Inspectors,” Argus, New York, New York, 12 April 1798, p. 2, col. 2; digital image, GenealogyBank (https://www.genealogybank.com : accessed 13 November 2018), Newspaper Archives. 6. ↑ “To Mr. Phillip Tabele, Editor of the Public Advertiser,” Columbian, 15 May 1811, vol. II, issue 477, p. 2; digital image, GenealogyBank (https://www.genealogybank.com : accessed 13 November 2018), Newspaper Archives. 7. ↑ New York, N.Y., “Probate Proceedings,” 1831, Jacob Tabele, pp. 465. 8. ↑ “Household Members,” New York Weekly Museum, New York, 8 August 1808, William Tabele death entry, p. 669; database online, Ancestry.com (https://www.ancestry.com : accessed 20 February 2016), citing “U.S., Newspaper Extractions from the Northeast, 1704-1930,” call no. 486670. 9. ↑ “In Chancery,” Evening Post, New York, New York, 18 October 1819, issue 5409, p. 4; digital image, GenealogyBank (https://www.genealogybank.com : accessed 13 January 2016), Newspaper Archives. 10. ↑ Catherine Hollister, compiler, Manhattan New York City Directory: 1829-1830, p. 544, “Jacob Tabele;” database online, Ancestry.com (https://ancestry.com : accessed 20 February 2016), citing Longworth’s American Almanac, New-York Register and City Directory for 1829. New York, NY: Thomas Longworth, 15 Pine Street, 1829. 11. ↑ “Find A Grave Index,” database, FamilySearch (https://familysearch.org : 13 October 2018), Jacob Tabele, 1831; Burial, New York, New York (Manhattan), Saint John’s Burying Ground; citing record ID 83709453, Find a Grave, http://www.findagrave.com. 12. ↑ New York County, New York, Probate Proceedings, 1830-1865, John George Tablet will (1783), vol. 35, pp. 206-207; New York State Archives; Albany, New York; Records of wills and probates, 1665-1787; Series Number: J0043-92; digital image, Ancestry.com (https://ancestry.com : accessed 20 October 2018). MyHeritage DNA Results Are In Bønsmoen It Is!